Fountain at Cudahy Gardens in Milwaukee, Wisconsin. A traditional fountain is an arrangement where water issues from a source (Latin fons), fills a basin of some kind, and is drained away. Fountains may be wall fountains or free-standing. In fountains sheets of water may flow over varied surfaces of stone, concrete or metal. Basins may overflow from one into another, or the overflow may imitate a natural cascade. Many fountains are located in small, artificial, ornamental ponds, basins and formal garden pools, and often they include sculpture. 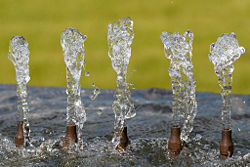 One of the most common features of a fountain, if there is enough pressure, is one or more jets, in which water is forced into the air under pressure to some height. A famous example of such a modern fountain rises from the surface of Lake Geneva. Three traditional fountain features: a low jet, a pair of raised basins, and sculpture with a water theme, here hippocamps (Villa Borghese, Rome). People often toss coins into fountains to make a wish. 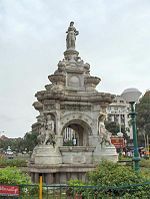 Flora Fountain in Mumbai, India. Early fountains depended on the natural gravitational flow of water, from a spring or aqueduct supplied by a distant and higher source of water, which provided hydraulic head. Hellenistic hydraulic engineers employed great originality in designing fountains, where the water pressure might be employed to animate automata and water organs. Reciprocating motion was first described in 1206 by Iraqi engineer and inventor al-Jazari when the kings of the Artuqid dynasty in Turkey commissioned him to manufacture a machine to raise water for their palaces. The finest result was a machine called the double-acting reciprocating piston pump, which translated rotary motion to reciprocating motion via the crankshaft-connecting rod mechanism. The Crank-Connecting Rod System in a Continuously Rotating Machine. Other early fountains were geometrically regularized springs, developed in the classic Persian garden. These gardens were typically enclosed and were designed to provide relaxation. The effect of sunlight was the main concern regarding the structural aspect of the Persian garden design. Shapes and textures were specifically chosen for their ability to direct sunlight. In the sixteenth century elaborate fountain displays were garden features of Mannerist gardens of Central Italy and the Mughal gardens of India. Early Modern English employed fountain to refer to a natural spring water or source, which the sixteenth century garden fountain might consciously imitate in a grotto. Christian allegory made much use of the concept of the fountain, specifically the Fountain of Life, associated with the rebirth that was intended to be experienced at the Baptismal font. The Fountain of Life appears in Christian illuminated manuscripts of Late Antiquity, and elaborate Gothic fountains formed centerpieces for enclosed gardens. An offshoot of the Fountain of Life was the legend of the Fountain of Youth, which Juan Ponce de León sought in Florida. From the Fountain of Youth one can drink to gain immortality, or to regain one's youth. 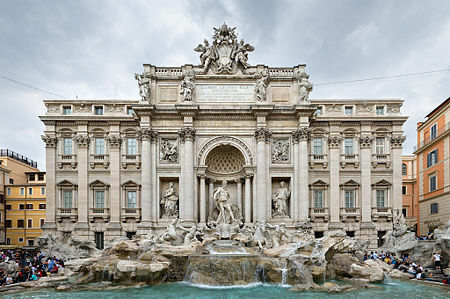 The practical Romans marked the delivery end of aqueducts with a public fountain, a practice that was revived in Rome in the fifteenth century, when the restored Aqua Felice once more delivered a symbolic presentation of its waters to Rome in the original Trevi Fountain, since replaced by the familiar Baroque fusion of water, architecture and sculpture. Animated fountain in front of the Brooklyn Museum consists of laminar flow water jets. Animated fountain in Moscow's Square of Europe, with cascades of water jets pulsating up and down to imitate the surf. 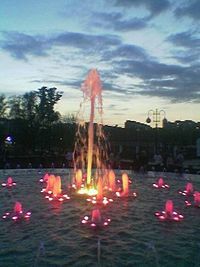 Animated fountains often use laminar jets that provide water that moves like ping pong balls in animation, so that it breaks up, as the height varies, and the behavior of each jet operates independently with up to 5 Hz modulation frequency (1/5 second), so that the water packets collide with themselves. For example, such fountains can spit up one ball of water which then explodes, showering people with a fine mist. A musical fountain is a type of fountain that dances in time with recorded or live music, controlled either by a computer or by a live "organist" operating the fountain through a switchboard. Notable examples of this are fountains on Vasilievsky Island in Saint Petersburg, Russia, and the fountains of the Bellagio in the Las Vegas Strip. In Islam, a fountain is the name of the place in the Mosque where worshippers can wash before Prayer. 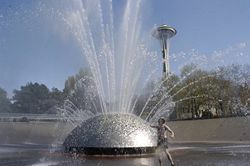 International Fountain (Seattle) was designed specifically as a bathing fountain (for fun and frolic) and includes a large nonslip play area, with speakers for music to splash to. A splash fountain or bathing fountain is a fountain intended for people to cool off in. Although many fountains were not designed as bathing fountains, children of all ages often use them for that purpose. Some fountains are fenced in, or have raised edges as a barricade to keep people out. In other situations, fountains are designed to allow easy access, and feature nonslip surfaces, so that people can safely use them to cool off in on hot summer days. Splash fountains have zero standing water, to eliminate possible drowning hazards, so that no lifeguards or supervision is required. These splash pads are often located in public pools, public parks, or public playgrounds (known as "spraygrounds"). A jogger cools off in the splash fountain that forms the main centerpiece of a flat open space known as Dundas Square at the heart of downtown Toronto. This fountain was designed and built for waterplay, and undergoes strict water quality testing standards. The water is heated using solar energy picked up by special dark colored nonslip granite slabs. 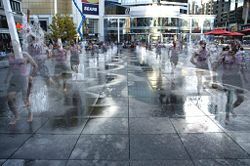 A recent example of a public splash fountain, intended for waterplay, is the one located in Toronto's Dundas Square. It consists of 600 ground nozzles arranged in groups of 30 (3 rows of 10 nozzles). Each group of 30 nozzles is located beneath a stainless steel grille. Twenty such grilles are arranged in two rows of 10, right in the middle of the main walkway through Dundas Square. Both the architects and the designers have confirmed that these were intended for waterplay, and the facility operators have confirmed that the water is treated to pool water quality standards, and that the water quality is tested, by the health department, at least once a day. The entire surface of Dundas Square is made of special nonslip square granite slabs that match the size of the metal grilles. The special texture on the slabs ensures that they are not slippery when wet. Spray fountains are designed to serve as a play area where children (and sometimes adults) can run around and cool off under a canopy of water. Spray fountains are becoming popular in areas where the construction of public pools is difficult or costly, such as urban areas. However, spray fountains can also be used to enhance a pool's surrounding play area. Modern, wheelchair-accessible drinking fountains of two different heights. A water fountain or drinking fountain is designed to provide drinking water and has a basin arrangement with either continuously running water or a tap. Modern indoor drinking fountains may incorporate filters to remove impurities from the water and chillers to reduce its temperature. In some regional dialects, water fountains are referred to as bubblers. Water fountains are usually found in public places, like schools, rest areas and grocery stores. Many jurisdictions require water fountains to be wheelchair accessible (by sticking out horizontally from the wall), and to include an additional unit of a lower height for children and short adults. The design that this replaced often had one spout atop a refrigeration unit. In modern fountains the traditional gravitational pressure from an unseen reservoir at a higher level is not always practical. In many circumstances fountains obtain their water from a closed, recirculating system that must still be filled at the start from the local water supply system and also topped up through its life to offset the effects of evaporation. Allowance must also be made to handle overflow in the case of heavy rain. The pressure that causes water to move through the fountain may be produced instead by a motor-driven (often submersible electric) pump. "Static head" is useful to quantify this pressure. An ornamental lit fountain photographed at night for about 6 seconds. A water filter, typically a media filter, removes particles from the water—this filter requires its own pump to force water through it and plumbing to remove the water from the pool to the filter and then back to the pool. The water may need chlorination or anti-algal treatment, or may use biological methods to filter and clean water. The pumps, filter, electrical switch box and plumbing controls are often housed in a "plant room." Low-voltage lighting, typically 12 volt direct current, is used to minimize electrical hazards. Lighting is often submerged and must be suitably designed. Floating fountains are also popular for ponds and lakes they consist of a float pump nozzle and water chamber. Many civic fountains in public parks are commissioned in commemoration of either national or public figures. There are also some limited fountain day celebrations. The University at Albany hosts an annual "Fountain Day," a day on which the university community comes together to celebrate the arrival of spring and the near-end of the semester. Drawing large crowds, the fountain-centered event creates something akin to an urban beach. A hydraulophone is a fountain that can be played as a musical instrument. These fountains are like woodwind instruments, but using water instead of air. The embouchure of the instrument occurs at the finger holes (referred to as "mouths"). Hydraulophones often have multiple "mouths," so that a player can put each finger into a different mouth at the same time, in order to play chords, while independently manipulating each finger for separate and individual control of the embouchure of each note in a chord. A skilled hydraulist can slightly "bend" each note in order to play just intonation in any desired key, or to gently and fluidly vary intonation or temperament as a piece of music changes from one key to another. 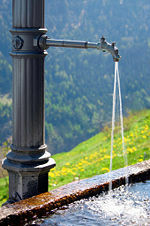 A fountain in the Swiss Alps used as a drinking source. There is a need for good water quality in contemporary fountains, regardless of their avowed intended use. Regardless of the fact that some fountains are designed and built not as bathing fountains, but are rather used simply as architectural decor, people will often drink from, bathe or wash their hands in any fountain. Additionally, fountain spray can contain legionella bacteria and has been linked to legionnaires' disease outbreaks. Therefore, minimum water quality standards are necessary, regardless of intended use. Guidelines have been developed for control of legionella in ornamental fountains. In July 1997, an outbreak of cryptosporidiosis was connected to an ornamental fountain at the Minnesota Zoo, which did not have proper filtration and water treatment. Children played in fountains and swallowed water, and spurted the water out of their mouths to mimic the way nozzles in the fountain spurted the water. It was therefore necessary to put a fence around the fountain to keep people away. In the United States fountain operators and owners are legally liable for failure to either fence-in fountains, or to properly filter, chlorinate or otherwise treat the water, if the fountains are not fenced in. If the water is unsafe, fences must be designed to keep people far enough away, so that they cannot touch the water, otherwise children get water on their hands, and put their fingers into their mouths, and end up getting sick, thus subjecting owners and operators to legal liability. The Fountain Four Lions in Sremski Karlovci, in Serbia. The Fountain of Tears (described by Alexander Pushkin) in the Khan Palace in Bakhchisaray, Crimean Peninsula, Ukraine. "City of Fountains" list, Kansas City, Missouri, the city with most fountains in the world after Rome. Fountain in Fountain Hills, Arizona. 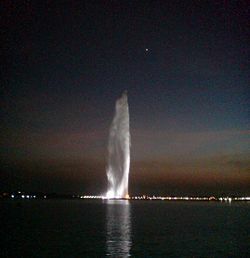 King Fahd's Fountain in Jeddah, Saudi Arabia, the world's tallest fountain with height of 312 meters (1,023.62 ft). Place Montreal Trust has highest water spout in North America, 30 meters or 5 stories high. The El Alamein Fountain in Fitzroy Gardens, Kings Cross, Sydney, Australia. Tubes and nozzles radiating from a hollow sphere. The fountain at Point State Park in Pittsburgh, Pennsylvania. The Fountains of Bellagio at the Bellagio hotel and casino in Las Vegas. The Gateway Geyser, the world's second tallest fountain, located in the town of East St. Louis, Illinois. Toronto Eaton Centre in Toronto, Canada. Tyler Davidson Fountain at Fountain Square in downtown Cincinnati, Ohio. The Jet d'Eau in Geneva, Switzerland. Fountain in the Eaton Centre (across Yonge Street from Dundas Square) basement. Double Monopole by Keith Sonnier—60-foot (18 m) tall sculptures at airport in Kansas City, Missouri. Underlit fountain at Forest Park in Saint Louis, Missouri..
Bahamon, Alejandro. 2007. Landscape Architecture: Water Features. Gloucester, MA: Rockport. ISBN 159253273X. Davitt, Keith. 2003. Water Features for Small Gardens: From Concept to Construction. Portland, OR: Timber Press. ISBN 0881925969. Hopwood, R. 2008. Fountains and Water Features. Princes Risborough, UK: Shire. ISBN 0747806071. Moore, Gene, with Jay Hyams, 1990. My Time at Tiffany's. St/ Martins Press. ISBN 978-0312034733. Kansas City, "City of Fountains". Ontario Science Centre's main fountain (hydraulophone). Fountains In The City Fountain-related site with recent news, history, famous fountains, and water feature designers. This page was last modified on 20 April 2017, at 14:39.